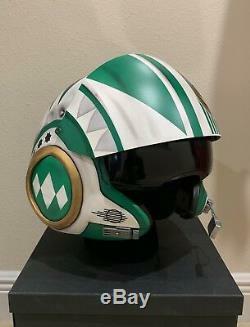 You are looking at a fully finished Star Wars Resistance X-wing pilot helmet, inspired by the Green Ranger from Mighty Morphin Power Rangers! 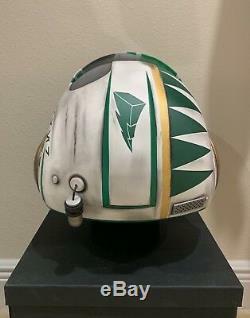 These start as a standard replica helmet, which I completely tear down and then rebuild, repaint and weather to screen accurate quality. I also upgrade the greebs (mic, resistor, blast shield bolt etc) with more screen accurate custom made detailed components. 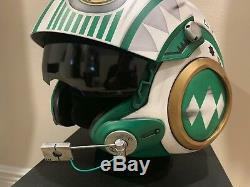 The helmet has a moveable visor which securely locks in either the lowered or retracted positions. 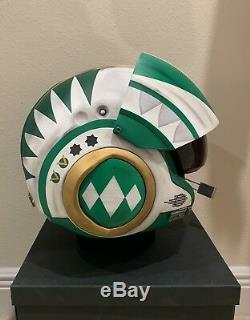 The visor for this design is finished with a special smoked tinting to match the original Ranger helmets, and definitely adds to the finished look of the helmet. These are made to order, and take 4-6 weeks to fully finish depending on the detail/complexity of the design and my current workload. 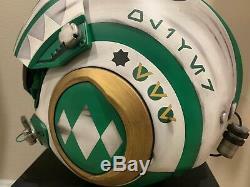 If you wanted a different Ranger inspired helmet (Red, Blue, Yellow, Black or Pink), I could do that as well! The design is flexible and I can make custom changes upon request so that you receive exactly what you have in mind! 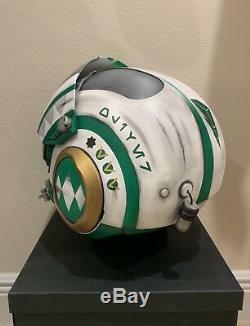 These helmets are painted using many different techniques and skills to create the perfect finish, including hand brush painting, airbrushing, stenciling and more! 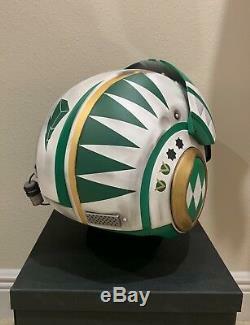 For example, the Gold on this Ranger helmet is HAND PAINTED using five different layers and paints to create an amazing realistic metallic gold layered looking finish! Its a very time consuming process but the results speak for themselves! 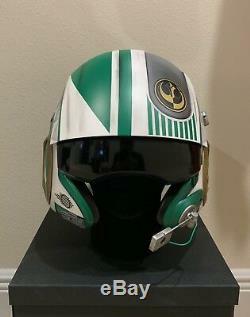 These are individually done myself by hand using your own designs and ideas, making these a totally unique custom piece of art you can only find here! 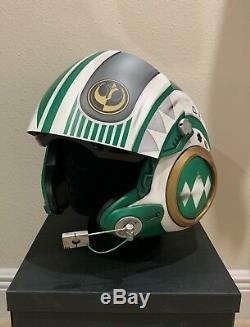 Thank you for your interest, and May the Force be with you! 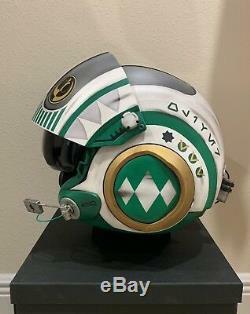 The item "Star Wars Custom Green Power Ranger MMPR X-wing pilot Costume helmet Movie Prop" is in sale since Sunday, January 20, 2019. 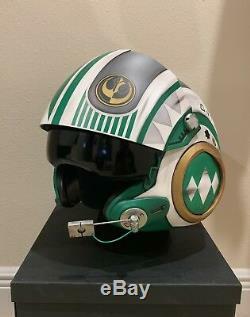 This item is in the category "Collectibles\Science Fiction & Horror\Star Wars\VII\The Force Awakens". 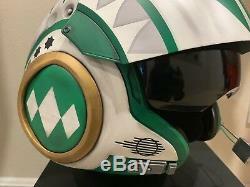 The seller is "trader806" and is located in Windermere, Florida. This item can be shipped to United States, United Kingdom, Denmark, Romania, Slovakia, Bulgaria, Czech republic, Finland, Hungary, Latvia, Lithuania, Malta, Estonia, Australia, Greece, Portugal, Cyprus, Slovenia, Japan, China, Sweden, South Korea, Indonesia, South africa, Thailand, Belgium, France, Hong Kong, Ireland, Netherlands, Poland, Spain, Italy, Germany, Austria, Bahamas, Israel, Mexico, New Zealand, Singapore, Switzerland, Norway, Saudi arabia, Ukraine, United arab emirates, Qatar, Bahrain, Croatia, Malaysia, Brazil, Panama, Jamaica, Barbados, Bangladesh, Bermuda, Brunei darussalam, Bolivia, Ecuador, Egypt, French guiana, Guernsey, Gibraltar, Guadeloupe, Iceland, Jersey, Jordan, Cambodia, Cayman islands, Liechtenstein, Sri lanka, Luxembourg, Monaco, Macao, Martinique, Maldives, Nicaragua, Oman, Peru, Pakistan, Paraguay, Reunion, Viet nam, Uruguay.